A Humvee among Vespas. Lifespan delivers on promises of reliability and weight capacity, and does so with an attractive, reliable, scuff-proof product. A self-lubricating belt feature makes the TR5000 essentially maintenance-free for the first couple years of use. However, at $1,500 the TR5000 doesn't offer a fraction of the value of newer, quieter, stronger office treadmills like the iMovR ThermoTread GT. Within the LifeSpan product line the TR5000 is The Beast. Its powerful 3.0 HP motor gives it the brawn to be used up to 10 hours a day in a multi-user environment. Attractive, reliable and durable, it also features a self-lubricating belt. While the TR5000 used to be the crème de la crème of office treadmills, it is noisier, larger, gobbles more electricity, and lacks the 24x7 duty cycle of its new direct competitor, the iMovR ThermoTread GT. For the same price, the GT offers a high-tech, full-color, touch-screen LCD console in lieu of the LifeSpan "brick," and features a built-in "click-wrap" liability waiver feature that business, government and educational customers now demand for obvious reasons. Compared to its own sister product - the more mainstream TR1200 - at half the price, justifying the TR5000's $1,500 price tag has always been difficult. Now compared to the iMovR ThermoTread GT, priced the same and with high tech features that run circles around the aging TR5000 design, the value just isn't there. Update: Since our original review Lifespan has upgraded the TR5000 model with a 3.0 HP DC motor and increased the weight rating to 400lbs. Underneath the private label, LifeSpan Fitness is a Utah-based distributor that sells cardio fitness equipment made by Taiwan-based StrengthMaster. They have taken three of Strengthmaster's cardio running treadmill models, removed the pedestal structures, and added brick-shaped, desktop consoles to offer three "re-skinned" office treadmill models: the TR-800, TR-1200 and TR5000. The "DT3" designation merely refers to the standalone treadmill base, as the DT5 and DT7 designations are used for the same treadmills bundled with LifeSpan's set-height and electric adjustable-height desk options. Like every other office treadmill on the market today–with the notable exception of the iMovR ThermoTread–these three models are re-packaged running treadmills under the hood. While well-built, they have their origins in gym equipment, and it's not hard to see. Generally speaking, running treadmills are larger and noisier than would be desired in an office environment. 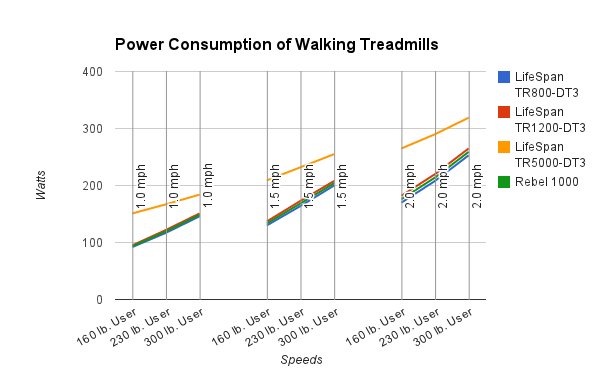 Less apparent, their internal gearing is not truly optimized for the much higher load that walking slowly on a treadmill induces on the motor versus having someone running on it. Nevertheless, LifeSpan treadmill desks have been fairly popular, awareness of them being boosted by numerous product placements on popular TV shows. In this review we'll go into greater detail on the TR5000 model–the most ruggedly built and capable of the three LifeSpan treadmill desk bases. For a comparison between the three LifeSpan models click on the "Compare LifeSpan Models" tab. You can also read how these models compare to all the others in the market–including makers such as iMovR, Steelcase, TreadDesk, Rebel Desk, Exerpeutic and Woodway–in our comprehensive Comparison Review of Standalone Treadmill Bases. Beginning in 2007 the walking desk industry was dominated by Steelcase in the corporate world and by TreadDesk (now defunct) in the residential market. Aside from these two contenders, there was little else for treadmill deskers outside of cannibalizing their running treadmills into ergonomically-horrifying DIY hacks. As the market for treadmill desks started to emerge from its DIY roots to more mainstream sensibilities, LifeSpan was really the first manufacturer to make a better commercial-grade treadmill that looked good, would last a long time, and include some snazzy perks that made the aging TreadDesk and Steelcase models look downright vintage in comparison. In 2011, LifeSpan introduced the TR800, TR1200, and TR5000. These re-engineered descendents of their gym treadmills were specifically designed to address the burgeoning demand from treadmill deskers. 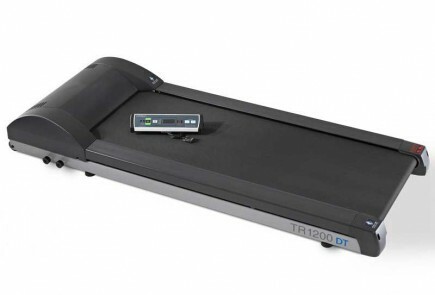 It didn't take long for the TR1200 to become the most popular treadmill base sold. Steelcase pulled in its horns long ago, with no intention of revamping its 2007-vintage WalkStation, and the other competitors were small, undercapitalized, and insufficiently impressive to give LifeSpan anything to really worry about. That all changed in 2015 with the introduction of iMovR's ThermoTread GT–the first clean-sheet design of an office treadmill–and new competition from LifeSpan's competitors in the gym equipment business. ProForm, NordicTrack, and InMovement (LifeFitness) have all introduced new models as to try and chase this enticing new market segment. Fortunately for LifeSpan and iMovR, these three behemoths (Icon and Brunswick owning the brands) botched their designs pretty badly. Today, it's really a two horse race between incumbent leader LifeSpan and technology-innovating iMovR. Upon entry of the ThermoTread into the market, in fact, LifeSpan immediately dropped the price of the TR5000 from the $1,999 ticket that it had since its introduction in 2011, to $1,499 in response to the competitive threat. When it comes to desks, however, LifeSpan has never demonstrated any core competencies. They continue to offer only the original two models–the DT5 and DT7. Both are one-size-fits-all affairs styled for the gym in putty and gray, and lacking in any ergonomic sensibility for modern computing. In contrast, iMovR offers no less than six desk models to match their ThermoTread, in many hundreds of color, size, and base-type combinations. In particular, iMovR's Omega desks–the Everest, Olympus and Denali–are the only ones on the market designed specifically for the rigors and ergonomic requirements of treadmill desk usage, giving LifeSpan some serious competition. The good news is you can mix-and-match a LifeSpan treadmill base with an iMovR Omega Desk, if you really want to. In fact, for the year preceding the introduction of the ThermoTread, that's exactly what a lot of users did. Automotive reviews speak in terms of "car chassis" versus "truck chassis" heritage. In the treadmill world, we equate this to "home fitness equipment" versus "commercial gym equipment." LifeSpan's TR5000 is definitely commercial grade, designed to take a lot of punishment. Compared to their mainstream TR1200 model, the buff TR5000's 145 lb. frame just looks like it was built for heavier duty usage. Where most other treadmills use dark-colored, extruded plastic parts for the non-steel sections of their frames, the TR5000 instead opts for upgraded, scuff-proof aluminum components that will look new for longer. Jump up and down on most treadmills and you'll see them flex in the middle. Not so with the TR5000 - these babies are built like Hummers. Manufacturers love to tout their horsepower ratings, but these are relatively meaningless, as we explain in our article on treadmill powertrains. Instead, flywheel diameter and weight, roller diameter, motor mount, controller electronics, deck material and thickness, and numerous other components all play a role in determining whether a treadmill's design is truly robust enough for its advertised weight rating. Cheaper components (surprise) lead to earlier equipment failure. The TR5000 features a brawny 3.0 HP AC motor, compared to the 2.25 HP DC motor in the TR1200. AC motors are used only in commercial treadmills, rarely in treadmills targeted at home usage. The reason? Cost, plain and simple. The benefit? Longer unit life. TR5000s come with a hefty 400 lb. weight limit. The one downside to using an AC motor, besides the cost, is the need for a cooling fan on the AC inverter. Unlike the DC motor-powered TR1200 and TR800, the TR5000 has a fan that stays on all the time, even after you're done walking. We wish that LifeSpan had added a heat sensor to know when the fan could be turned off. Other than bending down to turn off the power to the treadmill, the only way to defeat the fan is to hold down the STOP button for about five seconds; ten minutes after that the fan will finally turn itself off. Unlike some of the cheaply-built treadmill bases we've reviewed, the LifeSpan TR1200 and TR5000 both have strong motors, large rollers (reducing wear and tear on the walking belt, lengthening the life of the motor and other components), and spring-mounted motor mounts that keep a constant tension on the drive belt, making service calls a rare occurrence. The truest testament to the TR5000's strength relative to other treadmill bases is its much larger current draw, due to its AC motor. The DC motor-based TR800 and TR1200 models are nearly identical to each other in current draw, using about 1/3 fewer electrons. With all that horsepower the TR5000 does consume substantially more electricity than the TR1200 and TR800. That, along with the noisy fan, is the downside to using an AC motor. But if you're springing $1,499 for a treadmill base perhaps you're less concerned with the cost of electricity to run it. 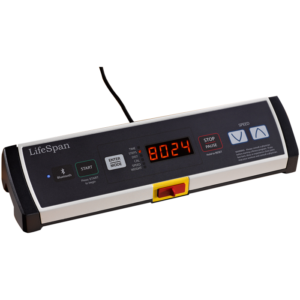 LifeSpan differentiates its three models by the number of hours of daily use they're designed for. The TR800 is rated for only 3 hours of daily use; the TR1200 for 6 hours, and the TR5000 for 10 hours. However, it's difficult to recommend a daily usage limit without accounting for the weight of the user(s) and frequency of preventive maintenance. If a 175 lb. user bought a TR1200 and never lubricated the deck it will eventually fail. On the other hand, a 350 lb. user who routinely sprays a little silicone oil between the deck and belt to keep his machine well-lubed is going to have something that will last for years and years without incident. But what if you wanted to place a treadmill in a shared departmental setting? Is someone going to take responsibility for lubricating the treadmill every week? This is where the TR5000 really shines with its "virtually maintenance-free" self-lubricating system. But there's a caveat: There are a couple reasons for the word "virtually" in that sentence. The belt is impregnated with a wax that reduces friction with the deck and rollers. Like with all treadmills, you'll eventually have to replace the deck and walking belt of the TR5000–no way around that–but that's only after 2000 hours (or two years, whichever comes first) of extremely low maintenance use. Lubricating every six months helps stretch that time out even further. The self-lubricating belt is the one feature the TR5000 has that the iMovR ThermoTread GT–not to mention all the other walking treadmills on the market–do not. That said, the iMovR unit has a 24x7 non-stop duty cycle thanks to its optimized walking-speed gearing ratios; gearing ratios that also allow it to sip the same amount of electricity as the TR1200 and other ordinary office treadmills. Most walking treadmill belt widths are between 15.75" and 18". As we state in our article on treadmill belt widths, 18" is a bare minimum for healthy walking on a treadmill, especially for hours on end. For some people, especially those who are wide-hipped, have a "duck-footed" stance, or who just tend to sway a little more in their stride than the forward-and-back marchers, 18" may not cut it. That's why we love the 20" belts on the TR1200 and TR5000. The spaciousness of a 20" belt is more than a luxury; it'll free you to make more lateral movements in your stride, which makes using a treadmill desk much easier on your hip, knee, and ankle joints. It also means you won't occasionally strike the landing strips with your feet, especially when reaching for items to your left or right , a common problem with 18" wide belts. A good walking treadmill base will be so quiet that the people around you will only hear your footsteps, not the motor or the belt scraping along the deck. One of the biggest differences we've experienced between LifeSpan's treadmill bases - one that they don't disclose in their specifications - is the distinct noise signatures of the three models. The TR1200 measures 57 dB down by the deck (even quieter at ear level). The TR5000 is only 1 decibel louder with its 3.0 HP motor, although the continuous fan noise is extremely annoying. Prior to the introduction of the ThermoTread these were the two quietest units on the market. iMovR now has even the TR1200 beat by a whopping 6 decibels, being almost completely undetectable to the ear in a typical office environment. This goes for all three LifeSpan models since they all share the same controller... their desktop consoles are well-weighted, relatively unobtrusive, and perform all the basic functions you'd expect. You've got your distance, time, speed, calories burned, and steps taken readouts, plus a Bluetooth Sync button for uploading your stats into the LifeSpan Fitness Club Software (though unfortunately most users report the kludgy software and sync are so buggy they quickly give up trying to use it). There's even a convenient USB charging port for your cell phone. Most other treadmills' control units are cheesier and less aesthetically pleasing overall. Of course there is no comparison to the ThermotRead GT's full-color touch-screen LCD controller with dedicated microprocessor. Remember what we said about the LifeSpan units' origins in gym equipment. Like all the LifeSpan units, the TR5000 comes with a lifetime warranty on the frame. The motor–the most important part–comes with a pretty good three-year coverage. All other parts are covered for two years and labor is covered for one year. That said, at WorkWhileWalking we've yet to ever hear of any TR5000 units failing in the field or being returned by a customer. They're that well built. Same goes for the TR1200. The Made-in-China TR800 is a different story, and its weak warranty is an important indicator of what your expectations should be. So let's sum it up. We can categorically state that of the three LifeSpan units, the TR5000 is the strongest and sturdiest. If you're looking for a unit that will look great, work well for many years to come, require virtually no maintenance, and tolerate boundless use and abuse, the TR5000 is the only machine to consider in the LifeSpan line. On the other hand we have to be very candid and point out that the TR1200–for $500 less–will still work just as well for most shared workstation environments. What you really get for the extra grand is freedom from lubrication, a very powerful (albeit electricity-sucking) motor, a gleaming aluminum frame that'll withstand rocket attacks, and peace of mind that it'll never creak, squeak, or whine under any load. Prior to the release of iMovR's ThermoTread GT, the LifeSpan TR5000-DT3 boasted the WorkWhileWalking Experts' Choice award for the heavy duty category. However, the competition from the iMovR unit is fierce. For close to the same price, it runs circles around the TR5000, being stronger, quieter, smaller, and featuring a smartphone-like console. Plus, the ThermoTread is designed to be an internet appliance, with many compelling, cloud-based software features that are expected from iMovR in the near future. While designed for the multi-user corporate environment, the TR5000 lacks one crucial feature that will shut it out of most business locations–iMovR's patent-pending, "click-wrap" liability waiver feature (just like the GPS navigation system in your car). Even the Roman Empire came to end eventually; the reign of the TR5000 as the most recommended unit for use in the business enterprise has clearly been ceded to the new, high-tech upstart. Belt Walking Area 18" x 45" 20" x 50" 20" x 50"
Console Dimensions 12.5" x 3" x 2" 12.5" x 3" x 2" 12.5" x 3" x 2"
Treadmill Dimensions 60.5" x 26" x 6.5" 63" x 28.5" x 7.25" 63" x 28.5" x 7.25"
Max User Weight 300 lbs. 350 lbs. 400 lbs. Treadmill Weight 96 lbs. 114 lbs. 119 lbs. It's worth mentioning iMovR's EcoLast TreadTop Standing Mat as a great add-on for the TR800, or any office treadmill, for that matter. When you want to take a pause from walking the last thing you want to do is stand on the cushion-less hard deck of a treadmill for very long, lest your feet start to suffer. These TreadTop mats are premium-quality, 100% polyurethane standing mats that are cut to size to specifically fit popular office treadmill models. They can be used atop the desk or astride the treadmill if you have a sit-stand-walk workstation, or both. Be sure to check out our 5-star review of the TreadTop Anti-Fatigue Mat. For LifeSpan units you'll want the 18" x 30" version that'll fit comfortably between the side rails. When it comes to treadmill lubricant the two most popular choices are LifeSpan's Treadmill Lubricant and iMovR's EasySpray Treadmill Lubricant. Both are 100% silicone oil but the multi-viscosity blend and improved nozzle design makes the EasySpray lubricant our experts' top pick. Another very popular accessory for any treadmill desk setup is an under-treadmill mat - also known as an equipment mat, or anti-static mat. There are several good ones available, which we review in our Treadmill Mat Comparison Review. Our top pick for the TR800 is the iMovR RightSize Under-Treadmill Mat, which is ideally sized and also much thicker than the others. It is simply not true that these are just re-skinned running treadmills. In addition to the console being different (obviously), they DO have different motors and pulleys vs. their running counterparts. (This is patently obvious if you look at pictures of, say, the TR1200i motor vs. the one in the TR1200-DTx) And if you ask LifeSpan about turning a 1200i into a desk treadmill, they will say the same thing. Also, your “reviews” would be a lot more ethical if you disclosed the fact that you are owned by iMovr in your reviews of competing products. While you meet the “letter of the law” by disclosing the relationship in reviews of your own products, it certainly violates the spirit of the law to not mention the relationship when constantly mentioning your products in the reviews of the competition. And no, I don’t work for LifeSpan (or any fitness or office equipment dealer), I’m just a happy 1200-DT3 owner. Stunningly awesome device. I bought mine on amazon, you can check out my review there. It does not flex, it does not do anything that it should not do. The base station that sits on my desk is awesome. It just works. I use it between 4-6 hours a day. I lubricate it once a week. I love it. It was a little expensive, but it’s worth every penny. The software is a little weird but I got it set up on my laptop, sending my stats to their website. Cool to be able to track your progress, makes it a little more fun. For anyone on the fence between the various price levels. The cheaper models are going to have more issues, if you’re willing to make that trade, that’s fine. But if you only want to spend the money once, get this one, it is worth it. Well I’ve had mine for about 2 weeks and I absolutely love it. I got it in the sale for £2500 (£500 off rrp) and I know that’s steep but I work from home and figured that it’s a small price to pay for my health. I’ve spent plenty of money over the years on gyms (which I rarely attend) and other fitness equipment and saw no benefit, admittedly mostly due to my own laziness. The Lifepsan Treadmill desk is a whole different experience. It doesn’t feel like exercise at all. I have to work at a desk 8 hours a day anyway so why not walk at the same time, and working whilst I walk means I’ve knocked up miles without even realising. It’s a doddle to get used to walking and typing. The desk raises to the perfect height to rest my wrists on so my hands don’t really move, just the rest of me. I start the morning at 1mph then quickly move to 1.5 and the 2.0mph. 1.5mph is the best speed for me to take voice calls on. I don’t get out of breath at all and people have no idea i’m walking whilst i talk. I always use hands-free kits. If i need to concentrate I can lean forward on the desk (to stare with intent and whatever I need to concentrate on) and carry on walking. When i’m just reading or responding to email I often up to the speed to 2.5mph which is a bit more of a “power walk” but it’s still easy to type and be productive. I should say I purchased 2 commercial grade monitor mounts that I’ve attached to the desk so my 2 ultra wide 29 inch screens are always at eye level. This means my posture is so much better as has my lower back strength. Just sitting a regular monitor on the desk wouldn’t be high enough for me. Also having mounts means I free up loads of desk space. I have an open work laptop under on of the screens so I effectively have 2 works screens. I also have a second personal closed laptop on the very handy shelf just under the desk. I also have 2 wireless mice and keyboards on the desk and still have two thirds of the desk space empty for phones, drinks, papers etc. (I work in IT hence the plethora of equipment). I can’t rave about this treadmill desk enough. When I’m at home I can easily do 8 miles a day and burn over 800 calories. I’ve never got on with exercise and this doesn’t feel like exercise which is why I love it. Offices everywhere should have them and here in the UK there are several enterprises and government agencies that have cottoned on to this and have starting installing them already. The only (slightly) negative thing I have to say is about it is regarding the Treadmill Desk App. It’s a bit fiddly to get used with the bluetooth syncing and if you stop (not pause) the treadmill the counters reset to zero. This also happens if you pause and the treadmill goes into sleep mode. The desk itself does not hold on to the data and neither does the app so you end up with multiple data sets rather than a single cumulative one, which is what I really want to see. Maybe there will be an update that gives you the option to store data cumulatively for a certain time period …. but even if not I’d still buy one of these again in a heartbeat. It’s easy exercise for the lazy !! So this is far more a review of Lifespan and their horrible customer service than it is of the treadmill. Unfortunately, I accepted my treadmill with a box with “warehouse rash”, and when I opened it, it had obviously been dropped on a corner at some point during shipping. The wheel on the front was shattered, the frame was bent, and the right extrusion arm was pushed slightly out of place. However, the treadmill was still functional. Not the end of the world. I received contacted the company, and received instructions to email pictures of the damage back to lifespan (PCE Fitness). I email the pictures back in and waited for lifespan to get back in touch with me. A week later, I again got in touch with lifespan, and arranged for what I thought was a replacement. I followed up to ask them about the replacement process. 15 days later, still no replies. For a $2000 treadmill I’d expect better service. I did setup the treadmill while I was waiting during my interaction with customer service. The treadmill itself was not that impressive. The belt started slipping after a week, and the treadmill did not automatically enter sleep mode. After stopping the treadmill I had to hold the stop/pause button until it reset in order to get the treadmill to enter sleep mode. If I did not do this or pull or the safety key the fan on the treadmill ran indefinitely. Not really a deal breaker, just annoying.